I love a shoe with texture and simplicity wrapped in clean, discernible design elements. 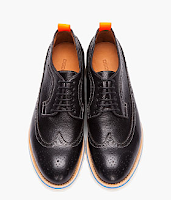 The DSquared2 Black Shark Stampatino Platform Brogue is a clean and interesting take on a classic brogue silhouette with modernized elements. 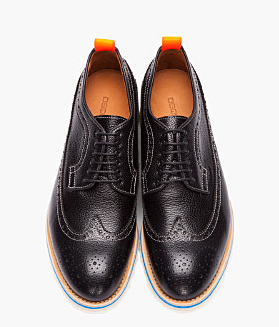 The classic remains with contrast brogue stitching and a strong yet supple pebbled leather upper. 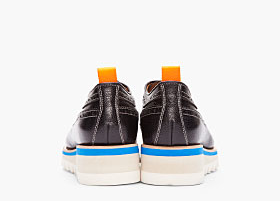 The modern is ushered in through the usage of the deeply notched stacked Vibram® sole rubber sole with blue mid accents and jaunty orange heel pull tabs. 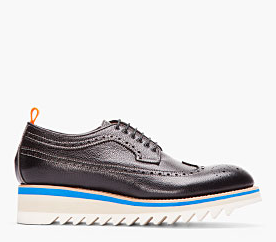 A cool shoe for the modern guy who loves the classics. Available now at Ssense.com.